Today's little work. 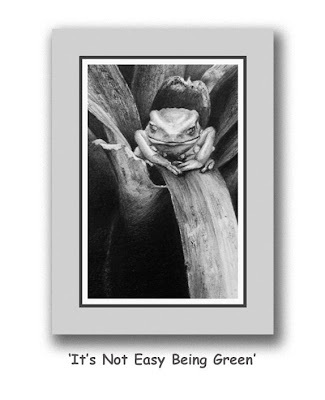 My good friend, Carel Peter B V K identified this little fellow as one of the Monkey Frogs. I knew if anyone would have a bead on the reference, it would be Carel. Thanks! When I shot the reference for this piece, way back a couple years ago at the National Aquarium in Baltimore, I had not made notation of the species. I like this little green critter .... might have to do another one! Image size on this one is just a hair or two over 4" x 2 1/2". Yesterday's little work - image size 3 1/4" x 5 1/4" . . . I was dismayed to read of the passing of one of my favorite movie 'STARS', Paul Newman. Unlike many others, I feel, who have had that title slid onto their heads, Mr. Newman deserved every inch of that word. 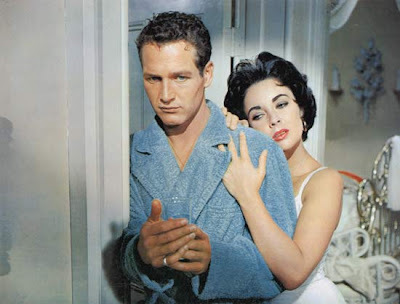 I think the very first time I saw him in a film was in Tennessee Williams' moody, Cat On A Hot Tin Roof, with another of my all time favorites, Elizabeth Taylor. Great performances in a very fine movie. If I remember it all correctly, a couple of my buddies and I wangled our way into a Saturday afternoon showing of the movie by 'padding' our ages at the ticket window! I think, if I am remembering it all the way it went down, there was an age restriction for that movie at that time. Well, anyway, I do remember what an impact that movie made on me and when I was a bit older and maybe wiser, sought out other stories by Williams, thanks in great part, to the fine, fine acting of Paul and Liz, as well as Burl Ives. Just looking at a list, again, of all the wonderful films that Paul was in, reminds me of many memorable hours sitting in the dark of a cool movie theater on a Saturday afternoon, or Friday night. Guys like Paul don't come along very often, in my estimation, and I guess in the estimation of many others from what is being said about him on the net. He made a damn fine spaghetti sauce too! Done - image size roughly 5" x 7". Feeling a little under the weather today so not sure how much work time will be had this afternoon. I will post this little shot of the first 45 minutes of work on this new piece. 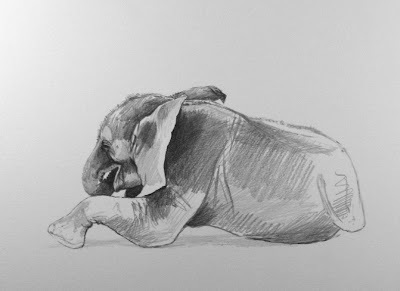 I am finally getting around to making use of all that great reference material I got earlier this summer at the Maryland Zoo in Baltimore of the new baby elephant. 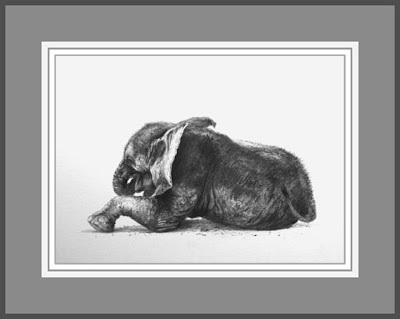 This one is going to be a joy to do as I have not really done an elephant work in quite some time and they really are and always have been, my favorite subjects. The next of the little works, image size of just over 5" x 3". A 'little something' worked on yesterday for the upcoming (mid November) Waterfowl Festival here on the eastern shore of Maryland. I have lost count on how long I have been doing this large scale show, but imagine it is going on 15 or 16 years now. Anyway, this is one of several smaller pieces I will be doing over the course of the next six weeks for the Festival, the image size on this one just a bit over 2" x 3 1/2". 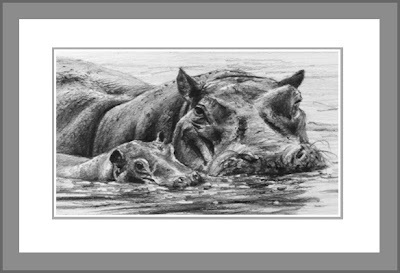 With the economic situation being what it is these days, I hope some of these smaller scale works will be appealing for many reasons, not least of which the fact that they will be in a very affordable price range at the show. The new work, image size 7" x 9" . . . 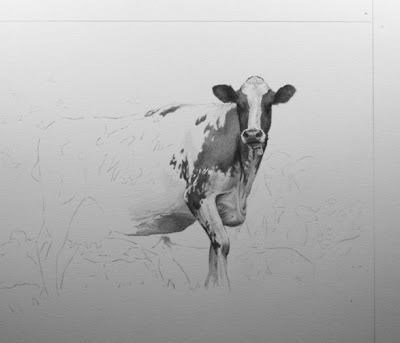 Continuing in the cow pasture today, and with apologies to Mr. Whitman . . . leaves of grass, leaves of grass . . . today's bit of work! 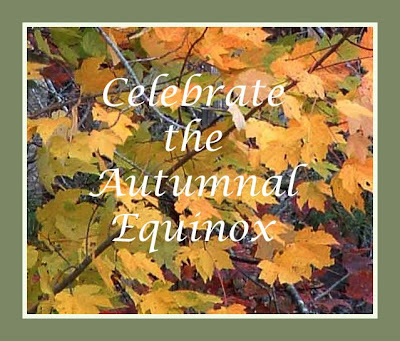 Ok, enough of sitting in the yard and taking advantage of this lovely mild September weather . . . time to get back to work. These next works are all going to be earmarked for the Waterfowl Festival coming up in a couple months, as well as gallery events later this fall. So with that in mind, here is the first piece up on the board . . . what seems to be some of my favorite subjects of late. No laughing cows, but maybe some jiving cows, as I have been listening to Duke Ellington most of the afternoon. Mooo! The other day, I decided to park on the patio in the backyard and see if the birds would not be disturbed by my presence while they enjoyed a fresh fill of the feeders. It worked! I wound up spending a quiet couple of hours enjoying the comings and goings and sharing the morning with the birds. I watched as a female cardinal fed seeds and such from the flat feeder to a youngster who was continuously squawking and chattering for 'more, more, more'! A pair of nuthatches darted in every once in a bit too, till they had their fill and flew off. Sparrows joined in too. The squirrels soon arrived from every direction and one brave soul even tried to climb up one of the poles only to be stopped in his tracks by the baffle; caught in an embarrassing position, I think he sure was baffled! It struck me as I returned to the indoors and reviewed my just snapped images just how much enjoyment I had had that morning. Thinking back, way back, to when I did my first work that included birds as subject matter, I was rather surprised at just how many works over these last ten years or so, had either had birds as the major subject focus or as a secondary focus. Considering that when I did my first piece that got into Birds in Art back in 1991, I had till that time, never done a work with a single bird in it. That first entry was done from borrowed reference material and the collectors who bought the work, were the ones who made me aware of the exhibition, which till then, I knew nothing about. So, all these years later, here I am in what seems like every other or at least every third work, using bird reference material as major subject matter. It is interesting, to me as an artist and simply as a person, to ponder the ramifications of avian inspiration and the paths down which that material has directed me. Let's hear it for . . . . the Birds! Yes I have indeed, been working this past week. This work, just finished up this weekend, is something special that I have been working on this past week, well actually having begun it before I left for Birds in Art. Somewhere just shy of 8 years 'overdue' I guess you might say, this work is the result of a promise made to my cousin's son back when he graduated High School, that I would do a work especially for him and subject matter of his own choosing, as a graduation present. I gave him a coupon valid for a five year period for him to tell me what he wanted me to do. Well, he went off to college in Maine and I finally heard from him, after some reminders and some gentle prodding from his mom and pop, just about the time the five year coupon was to run out. He wanted 'something Maine' to remind him of his time in school there. Well, fast forward to graduate work at the University of Maryland (just 'down the road' from where I am currently living) and I believe, the start of his third year there? Anyway, I finally have gotten around to doing this work for him and hope he will be pleased with it after such a long wait! I plan on surprising him with it some evening this week and don't think the surprise will be lost as I don't think he has ever looked at this blog page of mine. 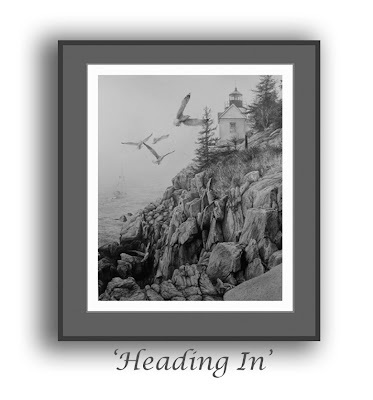 Anyway, here is the work, spotlighting Bass Harbor Light (referenced on a typical late winter/early spring, foggy morning many years ago on a ten day trip to Maine); image size is about 13" x 10 1/2" . . .
About this time last Friday, I was sitting down to lunch with artist friends at the first 'official' event of the opening weekend of Birds in Art. Today, I was sitting at my kitchen table enjoying a PB&J and enjoying the bathers in the backyard once again. Joining me for lunch were a mess of sparrows and a female cardinal as well as a very handsome gray catbird. 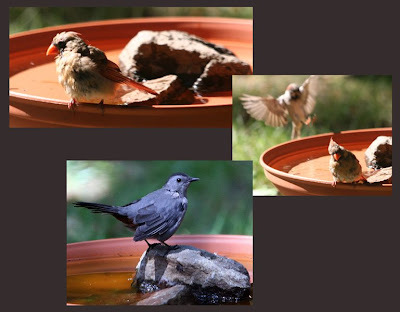 Birds, birds, birds, whether they be in Art, or taking a bath in my backyard, can't resist 'em. As difficult as it is for me to believe it this morning, I have just returned from my 17th inclusion in the internationally reputed exhibition, Birds in Art. As it always is, the weekend was wonderful in many respects, not least of which the opportunity to view, first hand and up close, some phenomenal art work and to meet artists from all across the globe, both 'first timers' and those who have made the cut in years before. It's a time for those of us who are fortunate enough to have been juried in on many occasions over many years, to catch up with artist friends we may only have the opportunity to see at this one time each year. It is always a wonderful thrill and highly anticipated moment when I walk into the galleries and catch a first glimpse of the work hanging on the walls. 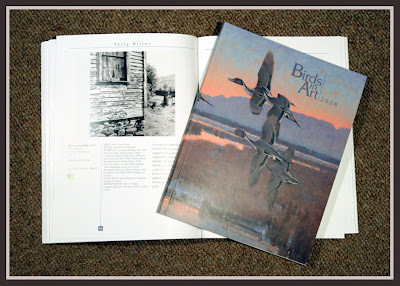 It is fun to leaf through the catalog, when handed our copies upon arrival in Wausau and quickly scan the pages, but the real impact, for me anyway, is always made when standing in front of the actual works at the museum. I personally, never look at the artist's name or any of the information, such as title or the work's size in the catalog when I initially scan through it. I am just really, glancing through to have an overall mind's eye image of the entire show. And then, when we get to the museum and walk in, I always like that feeling of 'Wow! ', when I see the first several works as I round the corner from the entry hall and proceed down the hall into the main galleries. As always, that 'Wow' factor hit hard upon seeing the first five works and just got stronger and stronger as I moved further into the galleries. This year's honoree as Master Artist was James Morgan. 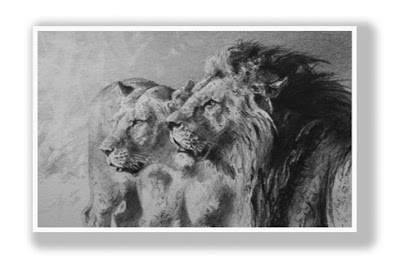 I have admired Jim's work over the years and was blown away by the small assemblage of 15 of his works that were spotlighted in the Master's Gallery, which included four lovely graphite studies. On Saturday morning during the public presentation of the Master's medal to Jim and his subsequent slide-show enhanced talk about himself and his work, we were all treated to Jim's wonderful, droll sense of humor. As I sat there and listened to Jim speak, talking about how he, as an artist, viewed the world and quoting from some of his favorite statements from other artists and writers, I was, as I have frequently been over the years of listening to the Master honorees in the past, taken by how much of what Jim was saying bore on me personally; how his view of the world was quite similar to my view of it. I guess we artists are a pretty connected group, even with our diversities of style and medium and how we translate what is inside of us for others to see, there still is that strong link and intense need to put down on paper or canvas or in three dimensions, what makes us tingle with joy, what excites us, what little details that others tend to overlook, catch our eyes. So, with those observations in mind, here follows a series of images from the weekend. Enjoy! These first couple of images show three more of Jim's refined, reflective and refreshing works . . . followed by an image of Jim (to the left) conversing with artist, Ed Aldrich. And here is Ed's beautiful painting of a pair of Trumpeter swans . . .
Larry Barth, 1991's Master honoree, is quite something when it comes to carving. This amazing work, all in basswood, shows just how impressive a Master Larry is. I know it is a bit hard to see the extent to which the branch extends out from his background in this image but this overall view gives a good indication of his abilities. The bird is life size, as are the indications of ferns. Or, are those real ferns? In this detail view, above, of Larry's work, perhaps you can judge a bit better the extension of the branch and marvel at his astounding abilities with that bunch of fern. In this next shot, Frenchman, Henry Bismuth is being interviewed by the local TV station. Henry stands before his wonderful raven work. In the six years that Henry has been juried into the exhibition, he has always submitted a work depicting ravens. Is it any wonder he dresses in black? This next work by Nobuko Kumasaka, is a wonder. Her work is a woodburned panel depicting a Shoebill, appropriately titled, 'My Name is Bill'! This was Nobuko's second visit to Wausau, having been juried in last year as well with another amazing woodburned image. In this closer look, above of 'Bill', you can get a better idea of just how much detail Nobuko is able to render in her interesting medium. Next, Colorado based bronze sculptor, Rosetta, poses near her work, 'Heron Rising'. She stands before, on the left, a lovely work by German, Eugen Kisslemann and to its right, a lovely, soft and quite appealing work of a white heron by Kim Donaldson. In the background stand Maryland sculptor, Paul Rhymer, a 'first timer' at the museum and with his back to the camera, Wes Hyde, another Coloradoan and one mean croquet player as I discovered on Saturday afternoon. This view above, from the circular staircase that leads from the upper galleries to the lower, shows the range of both two and three dimensional works that go to make up this grouping of the exhibition. As these images were all shot on Friday afternoon, at the artists' only gathering, the crush and crowds of later that evening at the Grand Opening and that of the Saturday morning Public Opening, were not apparent. In this shot, taken of the four works suspended on the circular wall at the staircase, can be seen, from left to right, works by Brit, Alan Hunt, New Englander, John Pitcher, Peter Gray of South Africa and last but not least, a gorgeous rendering of a Red-Winged Blackbird by Marylander, Mae Rash. 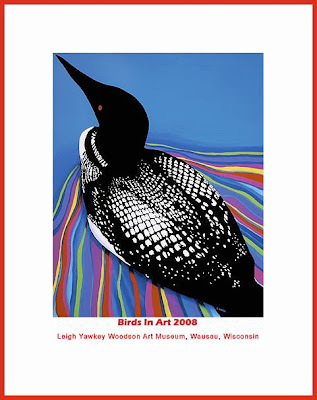 Here is a wonderful, bright, graphic Loon painted by Sedona, Arizona artist, Cathy Gazda. This image was one of several that the museum chose to use on posters for the exhibition as well as in National advertising and I can understand why with the very clean, graphic nature of the work. And, nudging in from the left margin of this image, we can just see Rod Lawrence's reading of a Black-Crowned Night-Heron. In this following work by another 'first timer', Arlene Rheinish, with whom I enjoyed the Friday Artists' Lunch, she has defined her vision of the Black-Crowned Night-Heron and in a most interesting compositional way, I have to say. Now, why didn't I think of that sort of composition? Good for you, Arlene and congrats on your first participation in this event! Robert Bateman, the 1982 recipient of the Master Award, stunned everyone and caused quite a sensation with the above, 4 foot square, graphite on canvas rendering of two Blue Herons. It really knocked my socks off! Below, Bob chats with another 'first timer' from North Carolina, David Simpson. And behind those two, 1993 Master recipient, Dino Paravano admires the exhibition. It was good to see Dino as he has not attended the opening weekend for a number of years. In the shot below is, front and center, sculptor friend, Don Rambadt's quirky and delightful Ground Hornbill. I never cease to amaze at how Don manages to pick and choose the most obvious scraps of metal for his terrific one-of-a-kind pieces. Behind Don's work is a piece by another fine artist friend, Ohioan, Mark Eberhard. In his work, cheered by both artists and the general public crowd alike, Mark has dramatically brought to light the plight of six endangered species of bird in his unusual, graphic, direct, most creative and inviting style. 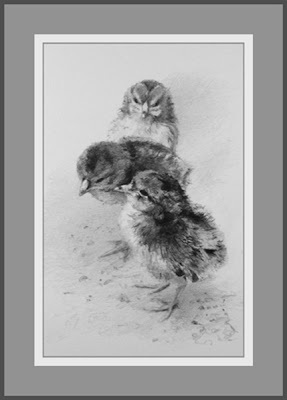 By dispersing his subjects at the very fringes of his canvas, Mark has, without question, shown the precarious nature of these feathered creatures. Above, is one of my favorite three dimensional works from the exhibition, this Rudy Duck by Oregonian, Stefan Savides. I had an interesting chat with Stefan on one of our many to and from bus rides back and forth from museum to hotel. And here again, Bob Bateman converses with a small group, including his lovely wife, Birgit standing just behind the head of the pelican sculpture. To the left stand 'first timer', Kim Middleton of Washington State, her husband and Kelly Singleton of Maryland, attending her second Birds in Art opening weekend. The nice bronze Pelican in the foreground is by Loveland, Colorado sculptor, Dan Ostermiller. 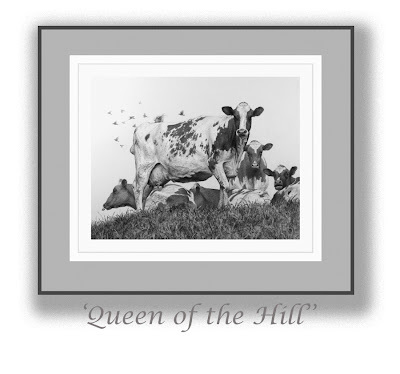 This next work, by Sedona, Arizona friend, Adele Earnshaw, shows how quite a few of this year's artists (including myself) made use of the square format in composition; one that, as I have mentioned many times in postings on this blog before, is not that easy to work within. Adele does it here, with apparent ease and grace. This truly was one of the works in my 'Top Ten' list! This work above, by friend and fellow graphite artist, Cole Johnson hung two works away from mine in the gallery and I was pleased to be able to catch up with Cole and his lovely wife, Mary, having not seen them for a number of years. This work had double appeal to me, as not only was it one of Cole's best efforts, I felt, but it was also from the personal collection of sculptor friend, Don Rambadt, mentioned above. This next, glorious riot of color in pastel, was by Floridian and friend, Janet Heaton. It just shimmered and glowed against that great peach colored wall panel behind. Jeremy Paul from the Isle of Man, painted this beautiful piece, above, very appealing to me and many others as well, but especially to me because I also had a fun time doing a lace curtain in my work that was a part of this year's exhibition. This next work by Californian, Randal Dutra, was another of the works on my list of fav's. Randy is a true master of rendering ethereal and quite evocative scenes and his landscapes just make me want to walk into them and get lost within their subtleties. These two works, above and hanging side by side, represent another two of my very 'Top Ten'. On the left a gorgeous gem of a work by Peter Baedita of Florida. Of course, being a graphite work, I was instantly drawn into it. Once I stood and let myself be totally absorbed in his work, though, I marveled at Peter's softness of line and simplicity of composition. Yet the work held so much more for me as a fellow graphite guy. Kudos, Peter! 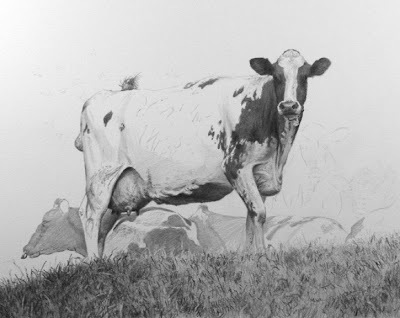 The work to the right by James Offeman, another of the 'first timers', breathed with so much life and depth and strength, it was hard for me to imagine someone being able to capture that much intensity and evoke so much emotion in me through the medium of pastel. Kudos to you too, James! And with a final flush of fond memories of the weekend just past, here is a nice overall shot of the main gallery with fellow Marylander, Paul Rhymer's delightful hippo and Purple Gallinule taking center stage. So now it begins all over again, the struggle to come up with two interesting compositions and ideas for my 2009 submissions. It's never too early! at the Leigh Yawkey Woodson Art Museum. from the midwest next week.